1999 was a year of great highs and dark lows for the slowly evolving Type I format as the remainder of Urza block tidal waved through the format. Watch as Keeper, Combo, and Necro compete on the Magic Invitational stage. Observe the sweeping restrictions that rocked the Type I format in 1999, and read about how players felt about and reacted to them. Learn the real story behind Magic’s only ever emergency banning. See what changes Brian Weissman made to The Deck following Urza block. Learn about the enigmatic yet subtly powerful Mercadian Masques expansion. Stephen Menendian paints a vivid and unforgettable portrait of a format at the precipice of the millennium and great change. 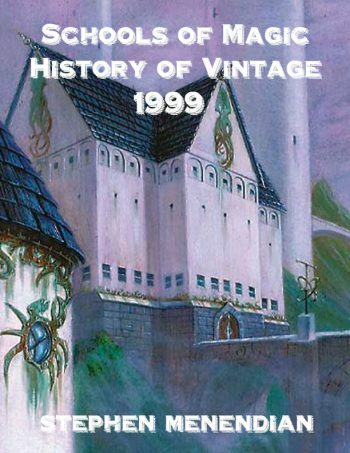 Stephen’s penetrating insight delves behind the facts, decklists, and results to reveal the hidden relationships in an unforgettable year in the History of Vintage. 1999 was a liminal moment. A decade of economic expansion and unprecedented international peace instilled a widely shared sense of hope and optimism about the future. Some called it the end of history, as the United States stood at the apex of a unipolar world. 1999 epitomized the decade. Although the Y2K computer bug scare was a brief concern, what was most newsworthy as the calendar flipped into the 2000s was the fact that nothing unusual happened at all. 1999 was a year of peace and plenty. Yet, just beyond the horizon, unseen, storm clouds were blowing. 1999 was a transitional year for Magic as well, and especially Type I, although disasters would manifest much sooner. In just six short years, Magic transformed from hot fad to an enduring gaming phenomena. No longer buffeted by shifting demand or external pressures, Wizards of the Coast institutionalized processes that provided continuity while laying the groundwork for future expansion and continued growth. The Pro Tour had become a prominent feature of the game, and regular block expansion, planned and developed long in advance, had become routinized. Set design and development was now organized in-house by career professionals who measured their work in years and even decades rather than months. The development and maintenance of the various formats satisfied the needs of diverse players in a now clearly global game. Yet, curiously, the pendulum slowly began to swing back in the direction of more powerful sets and potent cards. Weatherlight, Tempest, and Visions set a trajectory in that direction. Urza’s block represents an apex of that curve. The consequences for Magic, and the Type I format in particular, are profound and far reaching. Carefully tended for six years, Type I had but a few restrictions since 1995. 1999 not only saw a record number of restrictions, but the Restricted List nearly doubled in size by the end of the year after three separate waves of restrictions. The format that existed at the beginning of 1999 experienced the most dramatic changes in one calendar year seen since its inception in 1994 or even since. 1999 was the year that changed everything.